Milk paint and chalk paint are both great alternatives to regular paint, and many people often confuse the two or don’t know what sets them apart. So, to set the record straight, today we’re going to talk about milk paint, chalk paint, the similarities and differences between the two, and why milk paint is probably a better option for your projects. However, whereas chalk paint is generally only used for furniture, milk paint is used for many different types of projects, including furniture, walls, cabinetry, flooring, doors, wooden instruments, and more. The calcium in chalk paint creates a matte and chalky finish that doesn’t tend to show brush strokes. With some effort, you can manually create different finishing effects, including distressed and crackled looks. Milk paint, on the other hand, naturally distresses over time, which means you can achieve interesting and antique looks without even trying. Moreover, you can layer colors to create incredibly unique paint finishes. With milk paint, you can also add a bonding agent before painting, and this will create a predictable, non-distressed, and consistent finish just like you’d get with chalk paint. One of the greatest things about both milk and chalk paint is that neither of them requires priming or sanding before application. This can cut hours off your projects compared to regular paints. You can apply both paints with brushes, rollers, or sprayers, and both can be applied in a short amount of time. 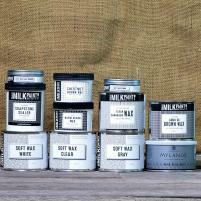 Milk paint is quite forgiving, and you can mix and match both milk and chalk paint colors to create custom palettes. Milk paint is thousands of years old and is made with simple ingredients like milk protein, lime, and pigments. Chalk paint as we know it now was created last century, but it also can use ingredients like, acrylic binder, calcium carbonate and pigments. Milk paint is an eco-friendly, non-toxic, and almost odor-free paint that can be used without fear of harming the environment. And while most chalk paint is also low-VOC and environmentally friendly, some manufacturers use harsher chemical ingredients. There are a number of similarities between chalk paint and milk paint, which can make it tough to choose between them for a project. But when it comes down to it, milk paint is significantly cheaper than chalk paint, it’s easier to create distressed and unique finishes, and it provides a more durable finish. In order for a chalk paint finish to be durable and long-lasting like milk paint, you have to apply several top coats of sealer. Most importantly ,milk paint also does not create a heavy looking thick film over the details of carving , trim and moldings like chalk paints. Milk paint will show all the details and texture of the wood grain on your projects. Milk paint, on the other hand, benefits from a top coat of wax or oil, but it’s still incredibly durable without it. So while there are a number of similarities between these two types of paint, milk paint is better suited for more projects, is more affordable, it will create a beautiful and incredible finish every time, and you’re guaranteed to be thrilled with the results. Lastly you can dispose unused milk paint to fertilize your plants and garden . Its completely safe to dispose on your property.